A double-size bed with clean, sharp lines; it immediately suggests the idea of discretely charming, and not ostentatious, luxury. 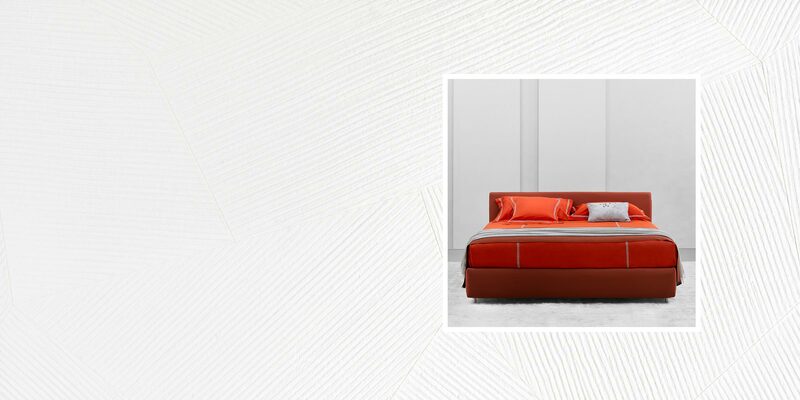 The original and architectonic shape of the headboard, framed by the eye-catching metal structure that continues downwards to form the feet, is softened by the fabrics that have been skillfully stitched with vertical quilting. This decorative addition appears to elongate the bed and contributes to the creation of a design that is welcoming and sophisticated. Available in the double-size version; it can be supplied with a slatted base, a storage base, a slatted base with electric movements, and the new base Leonardo. The covers in fabric or leather are completely removable. Decorative details of the headboard are available in polished black nickel or matt burnished. The sofa Myplace is the perfect reflection of the designer’s thoughts: live life with a passion. Three different depths are available to satisfy how everyone relaxes in comfort. The arrangements can be traditional linear sofas, pushed back against a wall, or spread-out like a fan, taking centerstage in the middle of a room. The seats, armrests and backrests – a total of twenty elements - can be arranged freely to create customized units. The sofa is supplied with completely removable fabric or leather covers. The tops of the Myplace coffee tables are hand-brushed cement and are irregular pentagons or hexagons. They are the perfect accessory to complement the sofa, sliding between the elements and following the curves of the compositions. The structure of the coffee table in matt burnished metal or polished black nickel, the top is in the unusual “Velasca” cement finish, available in the colors: cement grey and lava black. Two- or three-seater linear sofas with noble, reassuring esthetics. The clean, geometric and sharp lines are joined by the light touch of the double feet that raise it from the ground. A moderate seat depth and a compact backrest illustrate the accurate study of the proportions, to guarantee outstanding comfort. Large feather cushions, that can be scattered randomly, repeat the relief stitching of the sofa’s armrests, giving the composition a distinctive, elegant and contemporary appearance. Two-seater (170x85 cm) or three-seater (242x85 cm), available with completely removable leather or fabric covers. The feet are supplied with a matt burnished finish. The bench NEW BOND perfectly complements the bed from the same collection and repeats the distinctive tailor-made qualities. The padded structure rests on cylindrical metal legs and is embellished with cushions decorated by stylish exposed stitching. In the same way as the bed, the structure and cushions are anchored by belts in tone-on-tone leather or in a contrasting color - a design detail to exalt the elegance. Completely removable fabric or leather covers. In every version, the belts are in leather. The metal legs have a matt burnished or polished black nickel finish. Private, the natural evolution of the Flou wardrobe system, stands out for the luxurious stylish interior design that pays enormous attention to esthetics, for the new methods for anchoring the fixtures, and particularly for the unlimited possibility of personalization. Private consents systematic cataloguing of the wardrobe contents in response to every personal requirement of order and classification. The wardrobe “Private” is completed with two new door options: Pool and Velasca. There are two finishes for the interiors: Light, to exalt the fabrics and the colors; Dark, to exalt the garments and the accessories. Rich versions define the drawers, completed with trays, boxes and other containers; shelves and front panels in wood or porcelain stoneware (Concrete and Licorice finishes), and in glass, with or without light fittings, to exalt the contents. Clear or grey reflecting glass, with a handle that runs the length of the door. This door protects and screens the garments and accessories, while revealing them discreetly and elegantly. The interiors of Guardaroba 16.32 Private in the new Light finish, that exalts the colors and the fabrics; they coordinate with the Velasca door in the snow white finish: the hand-brushing of the cement ensures each piece is totally unique and unrepeatable. Close-up of the unit with drawers and light, front panels and top in glass; containers in different sizes and dedicated accessories for the drawers ensure order and exalt the contents. Close-up of the shelf with pull-out trouser-rack, with a convenient shelf that serves as tray. The top is in porcelain stoneware, Concrete finish. Cement 3 mm thick: this is a resistant, solid material yet it manages to transmit softness. The hand-brushing ensures each Velasca door is totally unique and unrepeatable. Available in three colours: snow white, cement grey, Lava black – it is ideal for people who love clean lines and elegance spiced with a contemporary soul. Reviewing interior design in relation to light: and light is the leitmotif of the latest Natevo 2019 developments. In this light, white is the protagonist and, combined with exciting splashes of color, it creates ambiences and situations that express energy, vitality and joy. Leave your email address to be informed when the novelties 2019 will be available in your city. According to and under the effects of articles 7, 13 and 23 of Decree Law No.196/2003, I hereby state that I have read and understood the above information provided by Flou S.p.A. regarding the use of my personal data, that I have been fully informed on my rights and on how and where I can exert these rights.